A new mathematical model could answer puzzling questions about frozen water. 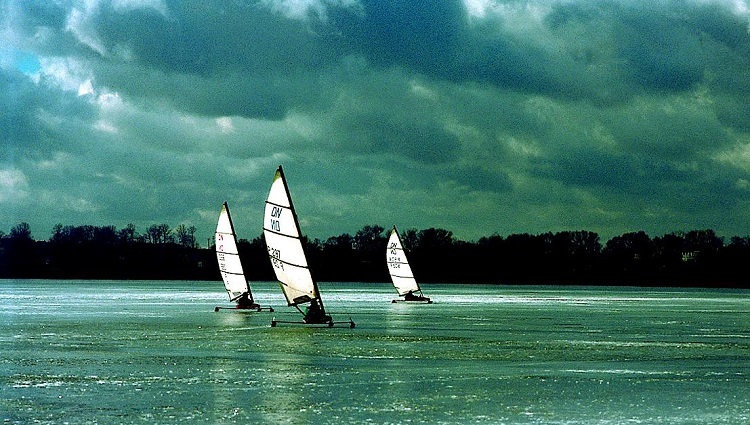 Ice sailing on the Żnin Small Lake in Poland. (Inside Science) -- For a solid material, ice is strangely slippery. While Olympic skiers and children on a snowy hill may or may not care why their favorite winter activities are physically possible, the question has bedeviled scientists for more than a century. Ice is "one of the most complicated" materials, said physicist Bo Persson of Forschungszentrum Jülich in Germany. "It behaves strangely compared to other materials." A new study published by Persson in the Journal of Chemical Physics provides a mathematical foundation for hypotheses that a liquid-like form of water on the ice surface accounts for its slickness. The finding could aid designers of winter sports gear who want to increase sliding on ice, and tire designers who want to minimize it. It could also help experimental scientists who have measured ice friction but have not been able to fully explain their results. "It is nice to see a solid physical justification of something that we always thought was happening," said Nicolas Spencer, a materials scientist at ETH Zürich and editor of Tribology Letters, a journal focusing on studies of friction. "It all makes perfect sense to me," he said. Although humans have harnessed ice's slipperiness for millennia — archaeological evidence for sledding dates back to at least 7,000 B.C., and to 5,000 B.C. for skiing — scientists began studying the phenomenon only in the mid-1800s. The renowned English physicist Michael Faraday noted that blocks of ice put next to each other freeze together, and proposed that liquid that forms on ice's surface and then refreezes was responsible. Early theories to explain ice's slipperiness suggested that pressure applied to ice causes its surface to melt, creating the liquid layer Faraday observed. These theories relied on one of ice's bizarre properties: Near its freezing point it turns from solid to liquid under pressure, whereas most materials do the opposite. But in most cases pressure, such as from a ski or sled, does not cause nearly enough melting to allow for easy sliding on an icy surface. Instead, a pair of physicists suggested in the 1930s that friction between ice and another material produces heat that melts the ice's surface, similar to how rubbing your hands together warms them on a cold day. While this observation explained the liquid layer better than pressure melting, it still did not account for why ice is slick even when you stand still on it. So others went back to Faraday's proposal and suggested various molecular-level explanations for a liquid-like layer that forms on ice's surface even below the freezing temperature. That notion of "premelting" aligns with studies of ice in contact with air. But studying ice under a sliding object is hard, says Persson, because the object prevents scientists from scattering light or other particles that could be used to gather data about the ice's microscopic structure. Scientists have instead measured forces on objects that they push across ice at various speeds, temperatures and pressures, and then tried to infer the molecular details. In the new study, Persson developed a mathematical model to explain the results of such studies. He found that he could describe many experimental results with a simple equation that relates shear stress — the internal forces that an object experiences in the direction parallel to the frictional force exerted by ice — to ice temperature. The equation resembles those that physicists use to describe certain kinds of "phase transitions," in which a material goes from one state to another at a certain temperature and pressure. Though bulk ice melting is an abrupt transition from solid to liquid, Persson says his equation suggests that the surface layer instead undergoes a more gradual transition through a state that has properties similar to both solid ice and liquid water, but is not fully either. For instance, the phase could contain disordered ice molecules, rather than the normally ordered crystals found in solid ice. A state similar to the premelting observed in ice exposed to air could account for the results his equation describes, Persson says. But he stresses that his equation does not describe what happens at the molecular level. "I am not really making any claim in this paper about a microscopic mechanism," he said. "Persson's paper did a good job of providing possible models that can account for the sliding friction-velocity behavior of ice," wrote Francis Kennedy, a retired engineering professor at Dartmouth College who conducted some of the experiments that Persson attempted to explain mathematically, in an email. But Kennedy added that he finds frictional heating a more convincing molecular-level explanation than premelting. In order to figure out what is really happening at the molecular level, Persson plans to conduct more lab experiments soon.